MGC Thompson with drum mag, one of the best models for reliable firing you can get. You do get on occasion stoppages but that is usually due to a bad round. Surprisingly i get more problems with the stick mag when it comes to jams and you would think it would be the other way around. Great to see the videos still coming!!!! 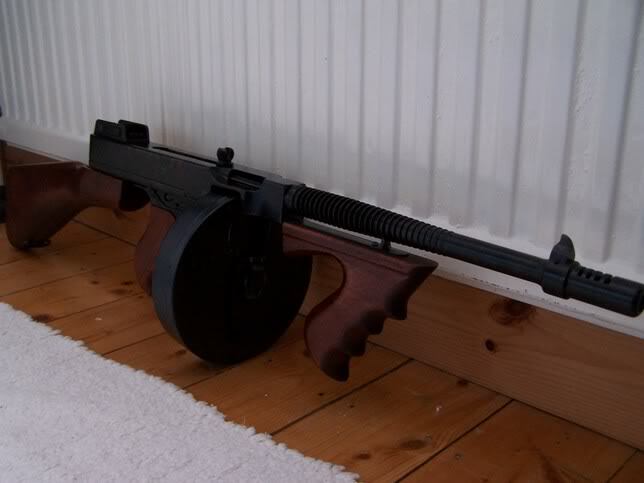 I have both the drum and stick mags for my MGC Tommy's, but have never actually fired the drum mags, yet! Videos like yours make me want to get them out and give them a go! Drum mag works really well, but you need to wind the spring up 8 or 9 times (well on my drum at least) to get to feed right. Trouble is if you fill it up its around 38 rounds, means a lot of loading and cleaning but its worth it.